As fires ravage Northern and Southern California, an unusually high death toll is mounting, and one of the blazes has become the deadliest in state history. The Northern California Camp Fire has killed at least 42 people, surpassing the 1933 Griffith Park Fire in Los Angeles that killed 29. All of the deaths in the Camp Fire have been civilians. Many people are still missing as a result of the blaze, and there is concern the death toll could rise. On the morning of Nov. 8, the Camp Fire broke out near Jarbo Gap in Butte County. The fire promptly destroyed nearly the entire town of Paradise, a community of 26,000 people located in the Sierra Nevada foothills east of Chico. As of Tuesday morning, the Camp Fire has burned 125,000 acres and is 30 percent contained, according to Cal Fire. Full containment is not expected until the end of November. In addition to becoming the deadliest blaze in state history, the Camp Fire has also become the most destructive in terms of number of structures destroyed. The blaze has destroyed 6,522 single-family homes, 260 commercial buildings and 772 minor structures. More than 100 additional structures have been damaged, and 15,500 are still threatened by the Camp Fire. The major fire burning in Southern California also started on Nov. 8. The Woolsey Fire, which has ravaged parts of Ventura and Los Angeles counties, including Malibu and the Santa Monica Mountains, ignited south of Simi Valley. As of Tuesday morning, the Woolsey Fire has burned 96,314 acres and is 35 percent contained. Two civilians have died, and three firefighters have been injured as a result of the blaze. 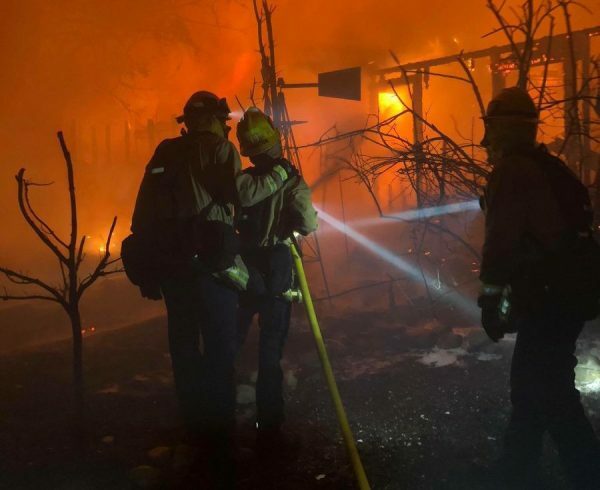 The Woolsey Fire has destroyed 435 structures and damaged 24. Another 57,000 structures are threatened. Just minutes before the Woolsey Fire started, another blaze likewise ignited in Ventura County. The Hill Fire started at about 2 p.m. on Nov. 8, in the area of eastern Camarillo and Newbury Park. The Hill Fire has burned 4,351 acres and is 90 percent contained, as of Tuesday morning. It has only destroyed two structures and damaged another two. On Monday, two more fires broke out in Ventura County, one of which burned close to Highway 118 in the Simi Valley area. However, firefighters quickly contained both of the new Ventura County blazes.